While the just-announced iPhone X is the hot new device right now, the Samsung Galaxy Note 8 is building up to a big release of its own, and breaking records along the way. 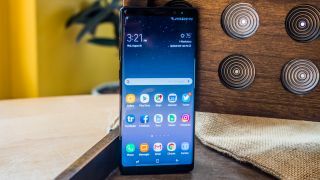 It was revealed just today that Samsung's new handset was pre-ordered a whopping 650,000 times over five days and across approximately 40 countries, according to Reuters. This not only beats pre-orders for the Note 8's predecessor — the Samsung Galaxy Note 7 — by about 2.5 times in that period, but also makes the Note 8 the most-pre-ordered entry in the Note family. The turnout also bodes well for the Note name, which was put in jeopardy last year when the ill-fated Note 7 was recalled worldwide for volatile battery issues. Despite the Note 7's reputation-damaging recall, Samsung fans didn't seem to waver. Out of 5,000 Note users Samsung polled afterwards, an impressive 85% reportedly said they'd give the brand another chance. The Galaxy Note 8 hits store shelves in the US and UK this Friday, September 15. The phablet releases in Australia a week later, on September 22. In the meantime, Apple fans (as well as the 15% of Note owners from the poll looking for an alternative) will have a lot of options to consider later this year. If you're thinking of making the switch to iOS, you have the new iPhone 8, iPhone 8 Plus and the all-in iPhone X to choose from. iPhone 8 vs Samsung Galaxy S8: which handset is for you?